Excel University Volume 3 picks up right where Volume 2 leaves off. This volume focuses on PivotTables, and we recreate the final report of Volume 2 with a PivotTable. Plus, we examine efficient ways to retrieve external data and various Excel features that enable us to communicate our message graphically. The features, functions, and techniques presented in this course are sure to shave valuable time off of your reporting tasks. 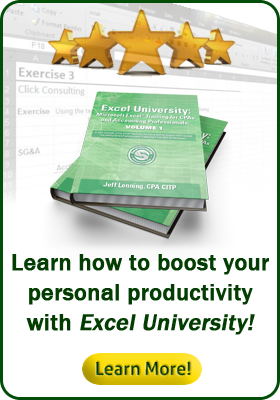 This course teaches the content of the Excel University Volume 3 book. The book chapters are available digitally inside the course during the enrollment period. Obtaining a printed/bound copy of the book is not required.